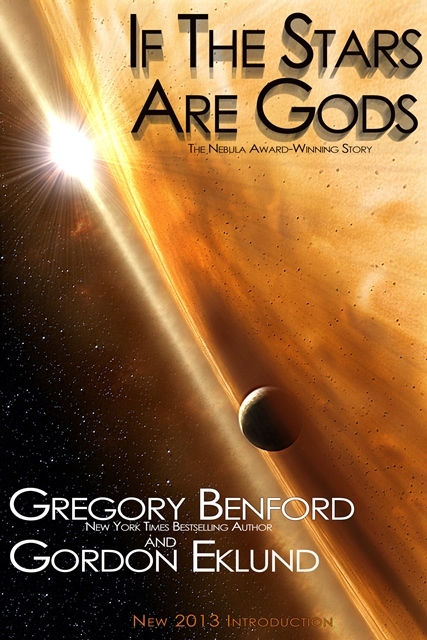 A collaboration of two science fiction greats, Gregory Benford and Gordon Eklund, the original If The Stars Are Gods was quite well received when it appeared in the spring of 1974 in the hardcover Random House anthology Universe Four. It went on to win a Nebula Award in 1975. A few critics found the central protagonist, Bradley Reynolds, to be a bit over the top — but then, who among us would invite Captain Ahab over for dinner, drinks and a video afterward? In this expanded novel length version of If The Stars Are Gods, which appeared in 1976, the rest of the life of Bradley Reynolds fell into place—meeting strange aliens, forging out into the realms of the solar system, always questing. This 2013 edition includes a new introduction by Gregory Benford and Gordon Eklund — the story of how their two science fiction writing careers grew out of this work, If The Stars Are Gods. Includes a bonus preview of Heart of the Comet by David Brin and Gregory Benford.